The 10′ x 8′ Windsor Shiplap Double Door 108 Shed shows you that you really can have a very large place to keep your children’s toys off the yard, stock your garden supplies and use for general storage all without an expensive price tag. 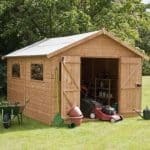 Offering you an incredible amount of storage room, this shed really is one fantastic deal. If your main priority is lots of extra storage space then you are going to be very happy with this. Four good sized windows will allow plenty of natural light into the shed and those wide double doors will make it very easy for you to get in and out. While the storage space and price is just ideal, you will find that the overall design is very well done and that this shed will look amazing in your garden. 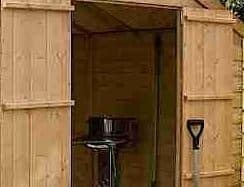 While this is a large shed with a low price it has not cut corners when it comes to the materials used to build it. Very high quality tongue and groove shiplap cladding has been used for the walls. Solid sheet boarding and pressure treated floor joists give you a durable floor and even the roof has been made with top quality wood. This is a shed which proves you do not need to pay a high price to have a high quality structure. The 10′ x 8′ Windsor Shiplap Double Door 108 Shed offers you lots of storage room, but it does it at a very cheap price. Windsor have done an incredible job in managing to keep the price down without really affecting the quality of the shed. The size on offer here really did impress us as the width is 8 feet and the depth a staggering 10 feet in size. The floor space for the money you are paying really is quite amazing. Windsor love to put a good sized roof on their sheds and they have certainly done that here with the ridge of the shed being 6 feet 9 inches high and the eaves being 5 feet 5 inches high. Organising things inside here or even doing the odd little job will not require you to be hunched over all the time. The apex roof on here will work wonders when it comes to protecting against the rain and the snow. 8 mm thick solid sheet boarding is used for the roof and while not the thickest boarding it does its job well and it enables Windsor to keep the price low. To cover the boards we have some felt which is rather heavy duty. We will admit that we did think the cladding would be on the thin side because of how cheap the shed is, but actually even with the low price, Windsor have used their 12 mm tongue and groove shiplap cladding for the walls. This is some very nice looking cladding which will keep the water out. We honestly are pretty amazed that they were able to use this type of cladding and still keep the price so low. Inside the shed we have a solid, 27 mm x 32 mm frame. This is a very good frame and we have seen frames similar to this on sheds that are sometimes as much as twice the price. This is a frame which will be sturdy and last for many years. This frame along with the 12 mm thick cladding really does give this shed a very robust feel. The floor is made from very similar boards that have been used for the roof, but these ones are 10 mm thick instead of 8 mm. These extra couple of inches do actually make a pretty big difference and make the floor that extra bit firm. The floor boards are backed up with some very heavy duty, pressure treated floor joists. These are fantastic and we can assure you that these will work wonders and allow you to store plenty of heavy things inside of here. 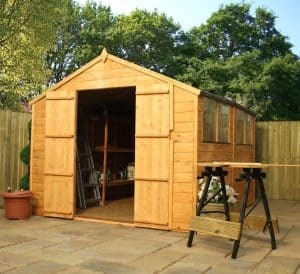 Windsor always give their sheds a free basecoat treatment so the shed can get through the delivery and installation process and not have the wood take any water damage. Once built, you will need to give it a very generous coating of wood treatment to protect the wood. This is something you will be required to do on an annual basis. 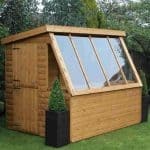 The ten year guarantee that Windsor give is one of the best we have seen from any shed manufacturer. This guarantee will protect you against rot as long as you remember to treat the shed. A large shed should always have a set of large double doors and we could not be any more happy with the double doors that have been used on here. With both doors open you have lots of room to get things inside without taking them apart. Most things with a little manoeuvre work will get in here no problems at all. The width of these is a very impressive, 3 feet 2 inches. These are very sturdy doors and that is because of the high quality hinges which hold each door in place. There are four fitted windows on the 10′ x 8′ Windsor Shiplap Double Door 108 Shed. These are a great size and they will let in plenty of natural light. When building the shed you can decide if you want to have all the windows on one side or two on one side and then two on the other. Strong shatter proof styrene has been used instead of glass to help keep the costs down and also protect you against having broken glass everywhere if the kids kick a ball through the window. 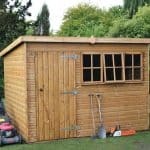 All of your belongings are going to be kept very well protected from the worst weather, but because of the very robust nature of the shed, you will also be confident that they are securely kept safe from potential thieves, especially with that pad bolt on the doors which serves as a real deterrent for thieves. While the pad bolt does a great job at keeping the doors closed. To really make this a secure structure you will want to add a padlock to the door. Any shed that has four windows clearly does not offer a lot of privacy, but we always think that adding some blinds or something else to cover the windows will take care of this. Customising a wooden shed is very easy these days as you can just change the colour by using coloured wood treatment. Also adding a few things to the outside of the shed like a hanging basket or even some kind of bird feeder would spruce things up a little bit as well. 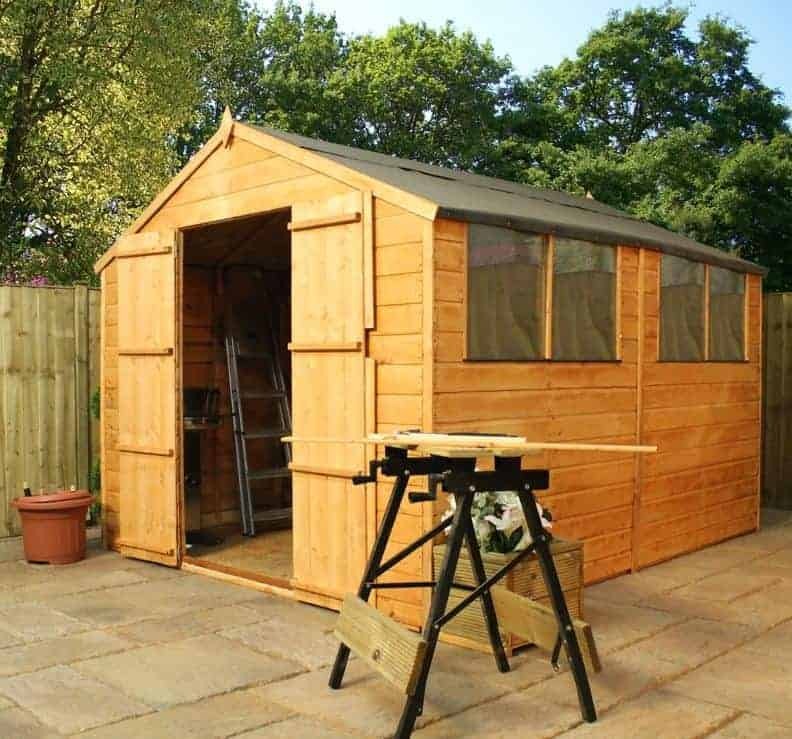 The main extra for this shed is a DIY Timber Base Kit which costs £136.99. 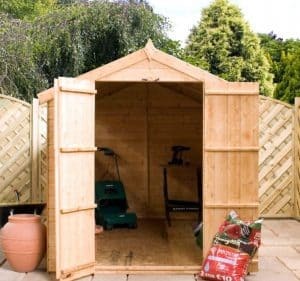 While the shed would be fine without this if you are a little worried about the area you are going to be building the shed it is worth looking into. No padlock is included with the shed so you will have to buy one of them, but as this is very cheap it is not really an issue. 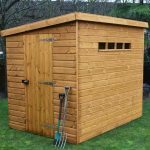 With the low price you may expect that corners would have been cut when it comes to the quality, but this is not the case and for the money you are spending, you really are getting one high quality shed. 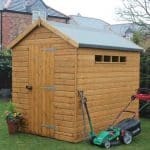 Make sure you look after the shed properly by coating it with treatment once a year and you will be amazed at how many years you get out of this. The amount of room in here is very impressive and no matter what your reasons for wanting a shed are. We are sure that this shed will be able to accommodate you very well. This is a large shed so it is certainly going to be a two person job. It should take no more than a few hours and the instructions are detailed enough that we feel even a novice to DIY should not have any problems other than an empty coffee mug needing to be refilled. The storage space you get for the money you will be paying really is quite incredible and makes this shed one fantastic deal. Final Thoughts: We are still scratching our heads trying to figure out how the 10' x 8' Windsor Shiplap Double Door 108 Shed is able to be sold at such a reasonable price without major sacrifices having to made to the design or selection of materials. The cladding, the flooring and even the not so thick roof are all of a quality that you would not expect at this price point and that really does impress us. 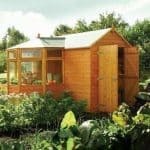 The design of the shed and the large space you have inside make this something we have no issues recommending at all and we are sure you are going to be very happy to have this in your garden.